Are you still frantically doing your Christmas shopping? We thought we’d help with some ideas for that special tween girl in your life. These are our favorites based on experience and Dot Girl customer suggestions. I gave this magazine to my 9 year old niece last year for Christmas and she liked it so much, her mother is renewing her subscription for this year. New Moon Girls is entirely advertisement free. Articles are written for girls by girls for ages 8+. There is also an online community that is safe and monitored. Article titles in the recent magazine include Body Language: Picture Yourself Perfect, Throw an Art Show, and Painful Beauty: What’s the Modern Foot Binding? The inventor behind the charms spoke at a business conference I attended this past summer and she passed out free samples. What a great product! Magnets on the bracelets are interchangeable leaving no end to your daughter’s creativity. She can even start her own Mogo Charms club and trade with friends. There are different themed magnet sets – everything from animals to peace symbols. Other products include purses and sunglasses, all with interchangeable magnets. Does your daughter love clothes? Would she like to do her own designing and then have the clothes made just for her? Then FashionPlaytes.com is the place for her. The site allows girls to design and wear their own dresses, hoodies, jackets, t-shirts, and more. There is even an option for customized jewelry. Girls pick out the style and color, and then add their own flair. It’s like playing with paper dolls but your daughter gets to have fun creating her own outfits. A favorite of my daughter when she was growing up (and my sons) and now my niece is reading their old copies. The series – for readers 7+ – follows a family of 4 orphaned siblings who make a home in a boxcar. Their grandfather does figure into the story also. The children solve mysteries and overcome obstacles in their path by working together. There are over 130 titles, so something for every reader. This year marks the 70th anniversary of the series which means many special editions are available. This is not a single toy or gift, but a website that offers products for girls that counter the princess culture that seems to have taken over girl books, movies and toys over the last few years. Products for infants to teens are included, with many book and movie recommendations. It really is a site where you can find the perfect gift to match your daughter’s interest and your values. This entry was posted in Dot Girl Recommends on December 20, 2012 by kathy. I am a born and raised Catholic. 12 years of Catholic school, church every Sunday, and no meat on Fridays. My family could not have been more traditional. My husband is Jewish. He was raised with Hebrew School, a Bar Mitzvah at 13 and Hanakkuh candles. Needless to say, when we decided we were meant to spend our lives together, there had to be a serious discussion on how we would raise our children in a multi-religious family. We settled on a compromise – both and then let the kids decide for themselves. As they matured, our three children each decided they were more comfortable in the Jewish faith, but didn’t want to give up the celebration of Christmas. Perhaps to honor me their mother, or perhaps they just wanted the presents! Which makes for a very busy December holiday season with the Eight Nights of Hanakkuh and Christmas Day. There are many ways Jewish/Christmas interfaith families can deal with the issue of what my husband calls the December Dilemma. There are two that are more common – separate but equal and blended. The separate but equal option is to celebrate both holidays as we do. This strategy works if both partners are comfortable with it although compromise still may be necessary. A plan also should be in place for extended family members. Being sensitive to the mingling of Hanukkah lights and Christmas presents under the tree when grandparents come to visit is something spouses should discuss. 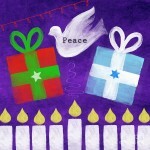 The second option is to try and blend Hanukkah and Christmas traditions. It is not unusual to see Hanukkah-themed Christmas ornaments in stores. This option also allows for some creative thinking. For example we send New Year’s cards to our family and friends instead of the traditional Christmas cards. Making up your own family traditions gives the holidays a specialness your children will always remember. Christmas is everywhere in our society and a major money maker for retailers. At Target yesterday I wondered through rows and rows of Christmas decorations and wrapping paper while there was one end cap devoted to Hanakkuh supplies. However, both spouses working together and respecting each others religion not only during the December madness but throughout the year can help instill a love and wonder in their children about their faiths. This entry was posted in Random Thoughts on December 6, 2012 by kathy.